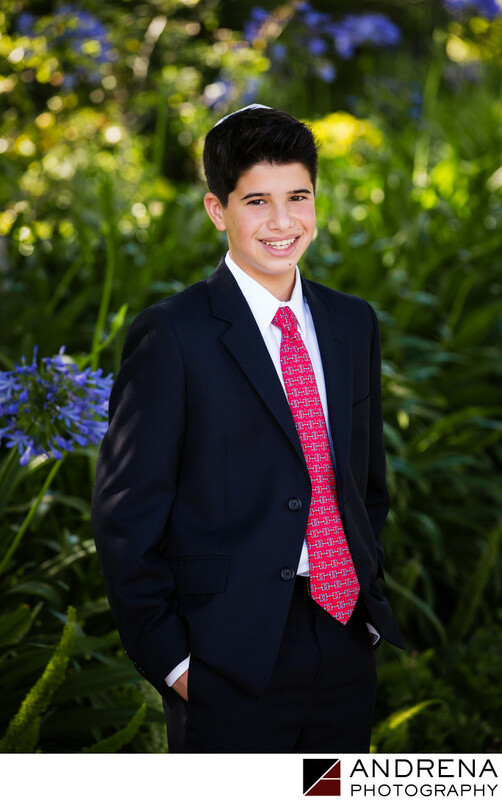 Beautiful Los Angeles greenery with a pop of purple provided the perfect backdrop for this handsome Bar Mitzvah boy's solo portrait at the Riviera Country Club in Pacific Palisades, helping mark what photographers know is one of the most important days in his life. To celebrate a momentous occasion such as a Bar Mitzvah, it's important that the photographer capture the youthful joy of the boy as well as the emerging maturity of the man he is to become as he is called to the Torah. Andrew's easy smile coupled with his grounded pose speak to the joyful moments to come. He is ready for both the profound commitment of becoming a Bar Mitzvah, as well anticipating partying the night away with all his favorite family and friends. Location: 1250 Capri Dr, Pacific Palisades, CA 90272.